Mt. 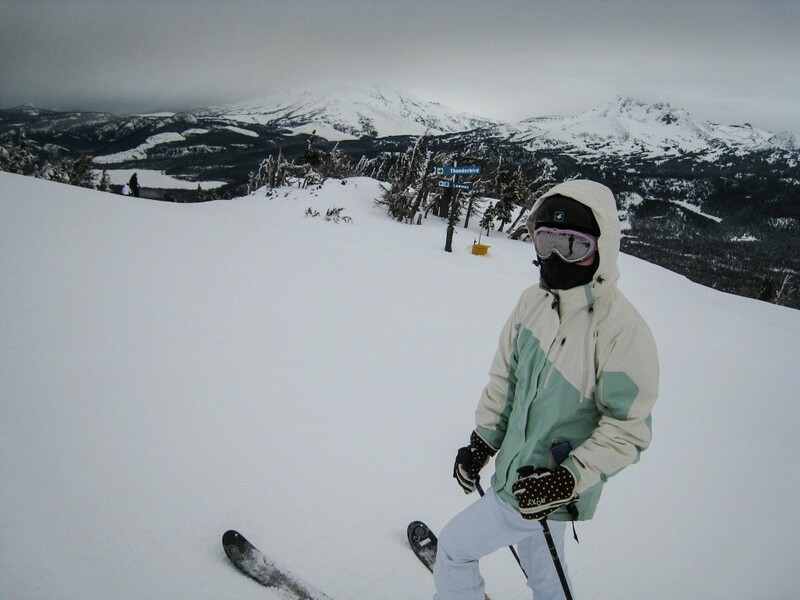 Bachelor is the largest ski resort in Oregon and is located in the central part of the state near the town of Bend. We drove up to Bend shortly after the New Year holiday to take advantage of a great lodging deal at a nice property and to take advantage of snow that was falling in Oregon but not on California early in the 2009/2010 season. Skiing Mt. Bachelor in January is a big risk weather-wise though, and we did run into some rain and wind. Mt. Bachelor is a pretty unique place, with runs and lifts cascading off an extinct volcanic cone spanning about 120-degrees of the cone. The top of the mountain is served by one lift that is often closed due to bad weather, so most of the action is on the 5 high-speed quads on the lower flanks that top out about 1,000 ft lower. This still gives adequate vertical to work with since the total vertical drop is 3,365. The Northwest express has over 2,300 ft of vertical, and was our favorite chair. That has some of the steeper terrain available on the lower mountain, with a couple of groomed black runs. The vertical becomes less on each chair as you go further around the mountain to the east, so we spent most of our time on Northwest, Outback, and Pine Marten chairs. Bachelor has something for everyone, but the main attraction for most will be the large variety of long intermediate runs winding through the thick woods on the lower mountain. 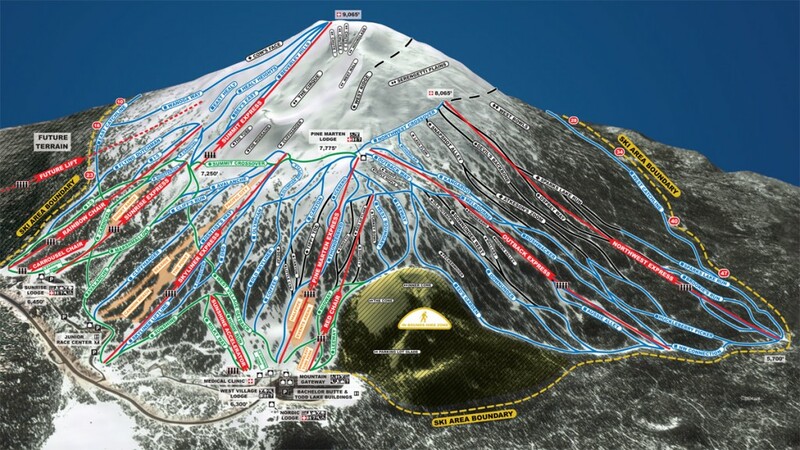 They are planning to add another lift even further east that will add even more green and blue terrain. The Summit Express is open when the weather is good, which was the case the first day. 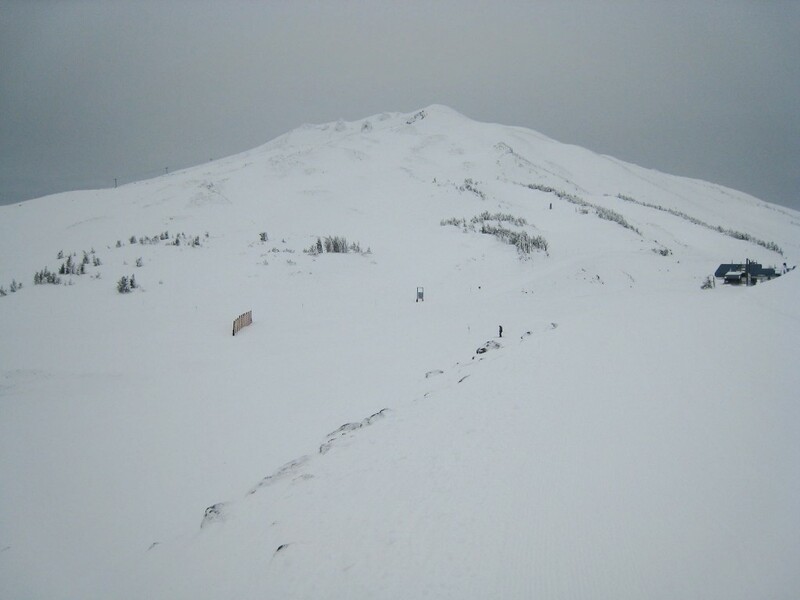 All the terrain is open with no trees, so navigating can be challenging if you don’t know the area and there is any type of visibility issues going on. The terrain is very interesting with some chutes and plenty of large snow fields that stay fresh. On the third day, we got on the Summit chair when it opened briefly. 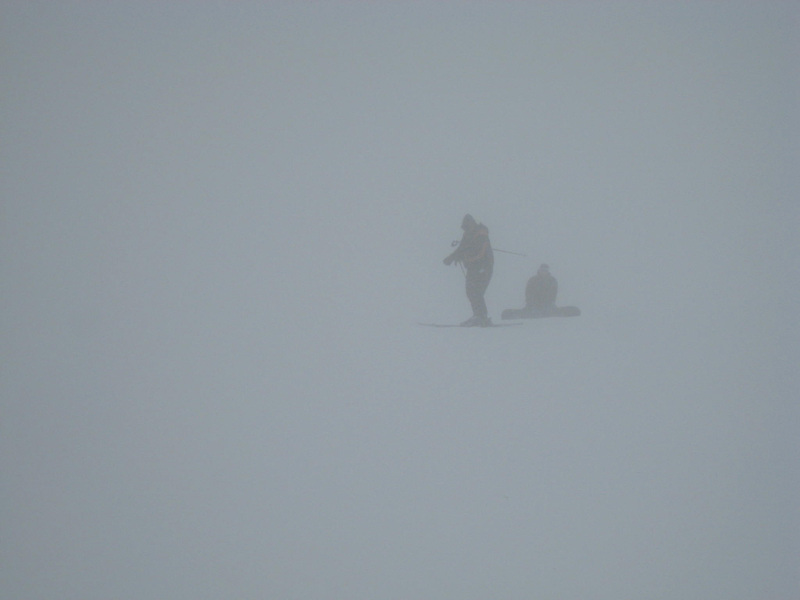 It was snowing lightly down below, but as soon as we started up the chair a gale came in with 50+ MPH winds, fog, and snow. This was perhaps the scariest moment of my 45-year ski career. I remember the visibility being so bad that I couldn’t tell if I was standing straight up or not. I ended up falling over just trying to stand on my skis. We couldn’t see more than a few feet and had to make it down 1,500 vertical to get down to the trees and marked trails. We made it without incident, but it definitely shook us up. Shortly after that the snow turned to rain up to 8,000 ft, so that was our cue to leave! In spite of that unfortunate scare, we have fond memories of that trip. There is a lot to like about the place, including the town of Bend which is a great place to stay. It has a really nice walkable downtown with lots of restaurants and shops. It’s not quite up to the standards of Aspen or Jackson, but is way better than average. 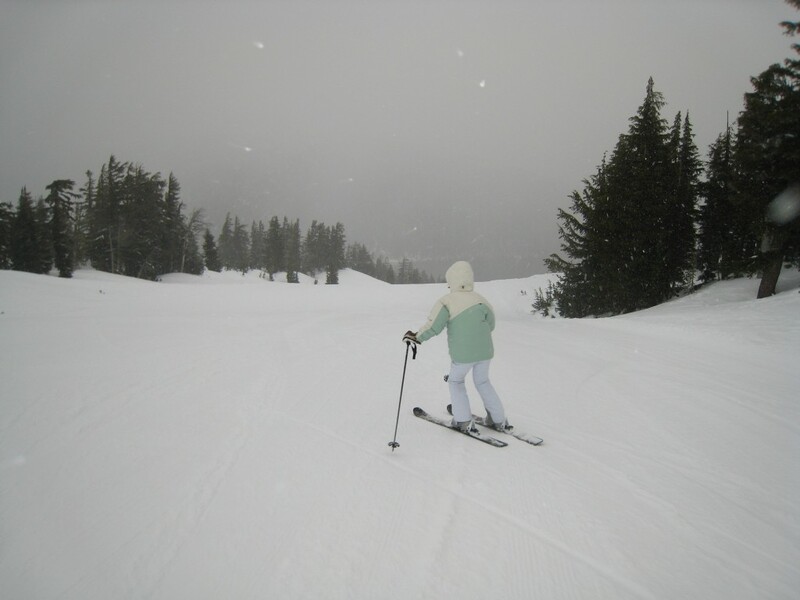 Like most of the resorts in the Pacific Northwest, rain can happen any month of the ski season. The mountain is a lone peak, so it gets hammered with wind during storms. This and the high humidity leads to frequent icing of the chairs which can cause long delays getting the mountain open. There is little or no lodging at the ski resort itself, which means driving down to Bend after skiing. We definitely want to go back as soon as we can. Bachelor is relatively close to us and RV camping is allowed in the parking lot, so we will probably drive up there with our truck camper the next time we go. Can’t wait to go back! Accurate description, possibly a bit higher rating than justified (and I live in Bend). Update, the new east side chair began operating 2016/17 season. Sent from site #34 Doran campground, Bodega Bay.